Santa arrives with his elves on Saturday 24th November! 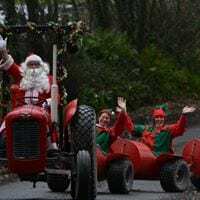 Book the 9.45am performance on Sat 24 Nov to see Santa arrive at the farm, Pennywell style. If you book the first performance on 24th, 25th Nov or 1st, 2nd Dec, Breakfast with Santa is included. book the 2.30pm performance on Sat 1st or Sun 2nd Dec and enjoy a Devon Cream Tea with Santa after your performance. A Christmas experience like no other! Leave the high street behind and lose yourself in the joy and wonder of Christmas. Journey with us as our authentic manger scene in the cosy barn takes us back to the very first Christmas with the arrival of the baby Jesus at its heart.